In the past, there has been a stigma around dental X-rays that often elicits questions from patients such as: Are X-rays really necessary? What can they show you? How often do I need them? Are they safe? In today’s blog, your dentist in Ft. Lauderdale takes the time to answer all of your questions about dental X-rays so you can understand how they might benefit you. Are X-Rays Necessary? What Do They Show Us? X-rays are actually a very important diagnostic tool that allows your dentist to see what is happening with your teeth and mouth internally. Certain X-rays give them the ability to assess your jaw joint, jawbone health, roots and teeth. X-rays can also help us diagnose cysts, infections, tumors, and many conditions that can’t be seen with the naked eye. Bitewing X-rays: These show your back teeth with one view, both upper and lower. They are typically recommended once a year and are used to diagnose decay between teeth, bone loss, and gum disease. Periapical X-rays: This image focuses on a single tooth, showing the crown, root, and bone surrounding it. A periapical X-ray is used to diagnose tumors, abscesses, impacted teeth, and cysts. This X-ray is typically recommended if you are experiencing dental pain or specific issue with a tooth. Occlusal X-rays: This X-ray shows the roof or floor of the mouth and is used to find foreign objects, clefts, or teeth that haven’t broken through. 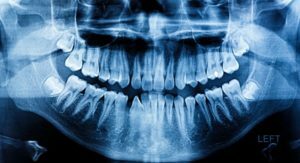 Panoramic X-rays: This image shows your entire mouth in one picture and it includes views of the jaws, teeth, sinuses, nasal area, and temporomandibular (jaw) joints, or TMJ. It’s recommended every 5 years or so as a baseline for your oral health. It also may be recommended if you are planning orthodontic treatment or implant placement surgery. Your dentist in Ft. Lauderdale utilizes digital X-rays, which are much safer for patients because they emit 80% less radiation than traditional dental X-rays. Digital images are also safer for our environment since they don’t require the use of chemicals for developing. When you are due for your next dental X-ray, you can rest assured that it is truly providing a service that is safe and beneficial for your oral health. However, you should always contact your dentist if you have questions or concerns about dental X-rays. Dr. Marc Mingel has gatheres a highly skilled team of dedicated professionals and specialists to ensure that patients in Ft. Lauderdale receive high quality and comprehensive care at Mingel Dental. Patients will feel right at home in our warm and welcoming office. If you would like to contact Mingel Dental, you can reach us by calling 954-566-1548 or online through our website. Comments Off on Do I Really Need X-Rays?